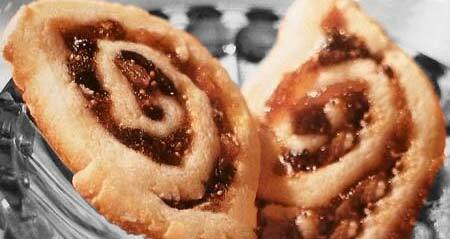 Italian cookies are synonymous with Christmas and these Fig Pinwheels are no exception. They are sort of like a rolled up Fig Newtons. The fig filling is sweetened with orange marmalade and orange juice. The English type of marmalade is a popular fruit preserve made with sugar, water and the juice and peel of citrus fruits (i.e. lemons, limes, graapefruits, mandarin oranges, and sweet oranges). Other areas may make their marmalade with non-citrus fruits. Fruit preserves are special preparations where the fruit is prepared (usually boiled) and then canned or sealed for long-term storage. Some of the most popular variations of fruit preserves include chutney, confit, curd, jam, jelly and marmalade. These fig cookies are winners and perfect for the company potluck or holiday dessert table. In a large mixing bowl with an electric mixer on medium-high speed, beat butter for 30 seconds. Beat in egg, milk, and vanilla until well mixed. Beat in as much flour as possible with the mixer and stir in any remaining flour using a wooden spoon. Cover and chill the dough for about an hour, making it easier to handle. Meanwhile, prepare the fig filling. In a small saucepan over medium-low heat, combine the figs, marmalade and orange juice just until boiling; remove from heat and set aside to cool. Roll half the dough into a 10x8-inch rectangle, between pieces of waxed paper. Spread half the fig filling over dough to within 1/2 inch of the edge. Starting with the short side, carefully roll up dough, using the waxed paper to lift and guide the roll. Moisten edges of the roll and pinch to seal. Wrap rolled dough in plastic wrap and chill for 4 to 24 hours, until firm enought to slice. Line cookie sheet with foil and lightly grease the foil, or use a silpat baking sheet. Cut rolls into 1/4-inch thick slices and place slices onto prepared sheets about 2 inches apart. Bake for 9 to 11 minutes or until edges are firm and bottoms are lightly browned. This recipe yields about 4 1/2 dozen Italian Fig Pinwheels. For best flavor, we recommend using the highest quality marmalade and fresh squeezed orange juice.